The chlorination of aromatic and heteroaromatic compounds is one of the oldest and also one of the most important reactions since it heralded the rise of the heavy organic chemicals industry. Reports of polychlorobenzenes and polychloropyridines date back well into the last century and it is of historical interest that Kekule was probably the first to have prepared pentachloropyridine. Yet, in spite of the ancient lineage and the practical as well as theoretical significance of polychloroaromatics, there has existed so far no review exclusively devoted to their chemistry. Three inter­ national symposia on polychloro-chemistry since 1968, in which polychloroaromatics figured prominently in discussions amongst chemists and biologists, are evidence for the growing importance of this subject. Information on the chemistry and uses of the numerous polychloroaromatic compounds has remained buried largely in the journal and patent literature and only occasionally receives sparse and incidental treatment in an article primarily dealing with a specific ring system. 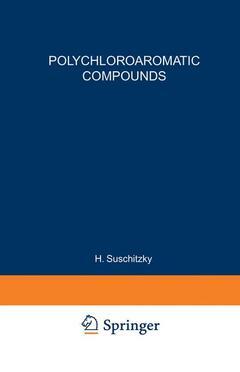 1 Aromatic and Alkaromatic Chlorocarbons.- 2 Polychloroheteroaromatic Compounds.- 3 Polychloroaryl Derivatives of Metals and Metalloids.- 4 Polychloroaromatics and Heteroaromatics of Industrial Importance.- Author Index.